The two Dutchmen take the doubles title at the ITF M15 World Tennis Tour event in Kaarst and will also compete in the singles final. Igor Sijsling and Botic van de Zandschulp dominate this week’s action at the $15,000 Kirschbaum International, held at Tespo Sportpark in Kaarst. 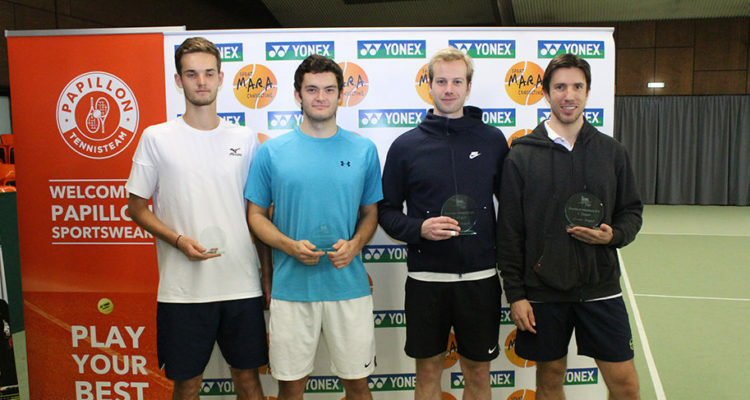 The two Dutchmen clinched the doubles title on Saturday and will also go head-to-head in Sunday’s singles title match. Van de Zandschulp opened the day on M.A.R.A. Center Court with a 6-7(5), 6-3, 6-2 win over German wild card entry Mats Rosenkranz. The No. 6 seed from the Netherlands sent down five aces, winning 81 per cent of his first service points to prevail after one hour and 43 minutes. Next up was Igor Sijsling. The defending champion had no problems to beat Robin Stanek from the Czech Republic, who rolled his ankle at the beginning of the first set and needed some treatment, 6-3, 6-0. Sijsling capitalized on four of his five break point chances to advance in only 53 minutes. Later in the afternoon, van de Zandschulp and Sijsling teamed up to win the doubles final. The No. 3 seeds defeated Mats Rosenkranz and Mark Whitehouse of Great Britain 6-4, 6-4. The encounter lasted 63 minutes. The singles final will start at 1 pm local time. Sijsling won both of the two previous meetings with his compatriot.